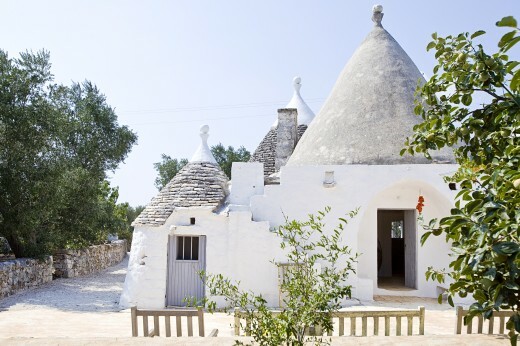 A quintessential trullo restoration that is both functional and stylish. Set in a lovely garden of olive and fig trees, sun-baked earth and dry-stone walls, Trulli della Mirandola offers comfort, peace and a pleasing minimalist atmosphere that is perfect for those in search of relaxation. Time spent by the pool is time well spent indeed, though you shouldn’t miss out on a few trips to nearby Cisternino, one of the Valle d’Itria’s loveliest towns. The pizza oven in the kitchen is merely decorative. Pool open from end of May to end of October. Inside: accommodation is spread across two buildings, a trullo and a poolside guesthouse. The trullo has been restored and refurbished so as to maintain the charming original features and minimalist atmosphere that are so characteristic of Puglia's most iconic constructions. The main entrance accesses a large hallway and sitting area, off which are two double bedrooms and their adjacent bathrooms (one with a super moulded sunken bath and one with shower). A short corridor leads through to the extremely pleasant and spacious open-plan kitchen diner and living area whose enormous sliding wall-length windows offer seamless communication with the gardens and an al fresco dining area. The poolside guesthouse, surrounded by a shaded wrap-around terrace, comprises a double room with en-suite shower room and a connecting twin room, also with en-suite shower room. This latter may be used as a living area if not required as a bedroom. Both can be accessed independently from the pool area. Outside: a short path from the trullo leads down between the fragrant Mediterranean shrub-planted gardens to the guesthouse and the delightful pool, which has a large, well-furnished pergola. For lovers of al fresco dining, Trulli della Mirandola offers an enticing number of options: one just outside the trullo kitchen, one down by the pool and another in the garden, complete with built-in barbecue area. The whole property is surrounded by several acres of whispering olive groves, offering a peaceful, relaxing atmosphere in which to wind down after a hard year's work. Trulli della Mirandola is set in the heart of the Valle d'Itria, a few minutes' drive outside the charming town of Cisternino. The geography and views in and of this area are what many consider to be the "typical" Puglia. Rolling hills, groves of centuries-old olive trees, trullo cones everywhere you look, whitewashed towns bleached further by the southern Italian sun. But Trulli della Mirandola is close to the beach too: a drive of about 20 minutes will take you to a long sandy beaches of the Adriatic coast, where you can either pitch up where you find a space or check in at one of the stylish lidos on the coast. "Trulli delle Mirandola was all very well thought out and well maintained. Our holiday was fantastic and we will book with you again!" Overall we had an amazing holiday and really felt the setting, location of our villa couldn’t have been better.We absolutely loved the grounds and style of the villa. However, the size of kitchen was too small. We particularly enjoyed all the fresh herbs, vegetables and fruits in the garden. It was such a nice surprise to find this at the property. Trulli della Mirandola was a very well cared for and fitted out property. We absolutely fell in love with Trulli della Mirandola and its grounds. I couldn't imagine a lovelier experience. It is beautifully redone, clean and charming, We really loved it and I would love to go back again. The caretaker was amazing. Such a perfect holiday! I would love to return to Puglia again and again! Trulli delle Mirandola was all very well thought out and well maintained. Our holiday was fantastic and we will book with you again! We had a wonderful experience at Trulli della Mirandola. We were in love with our in-villa cook. We strongly recommend her to anyone staying at the villa. The service of The Thinking Traveller would be welcome all over the world! It truly is the best! The property was as advertised and wonderful. We loved our holiday at Trullo della Mirandola, it was even better than I hoped and we are looking forward to staying in Puglia again and hopefully for a longer period. Lovely villa & location. We had an excellent holiday, thank you. Trulli della Mirandola was excellent all round. Beautiful pool and home. The property and grounds were pinch yourself stunning and we felt incredibly well looked after by Sandro & team. It was lovely and relaxing... Everything was easy and very relaxed - a bonus with small children. There were lots of small towns in close proximity all very beautiful to explore. C'était une très belle villa parfaite pour une famille comme nous... Après une bonne journée de visite, le plaisir de retrouver notre maison au calm.